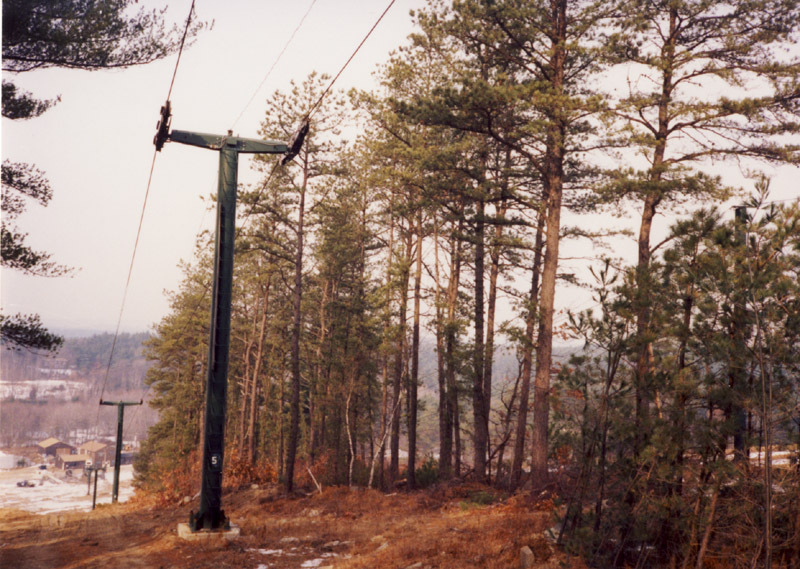 Blanchard Hill, located in Dunstable, Massachusetts, was a classic family ski area that operated for over twenty five years. 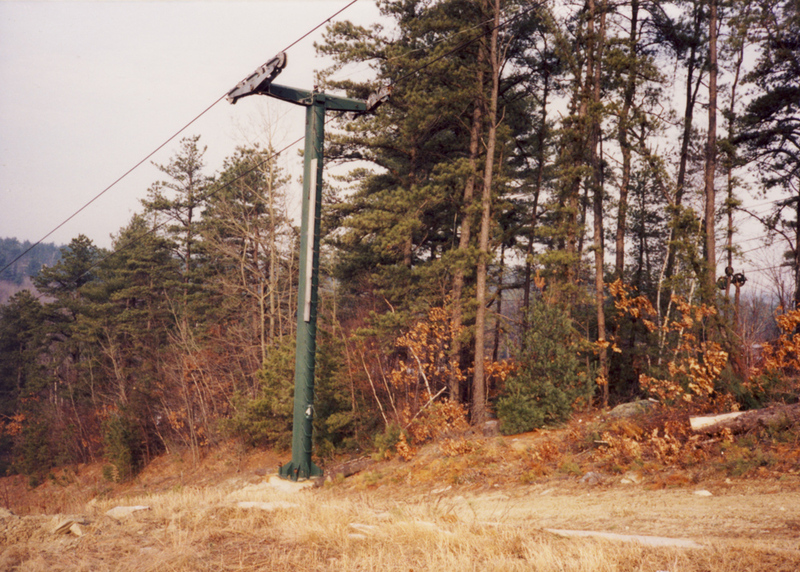 Beginning as a rope tow only ski area, it eventually added two T-bars, and even a double chairlift in its final years. The vertical drop was only 170', yet there were more slopes and trails than one would expect for a small ski area. The area closed about 1987 or 1988, and now is a blend of both a housing development, as well as conservation land with beautiful views. 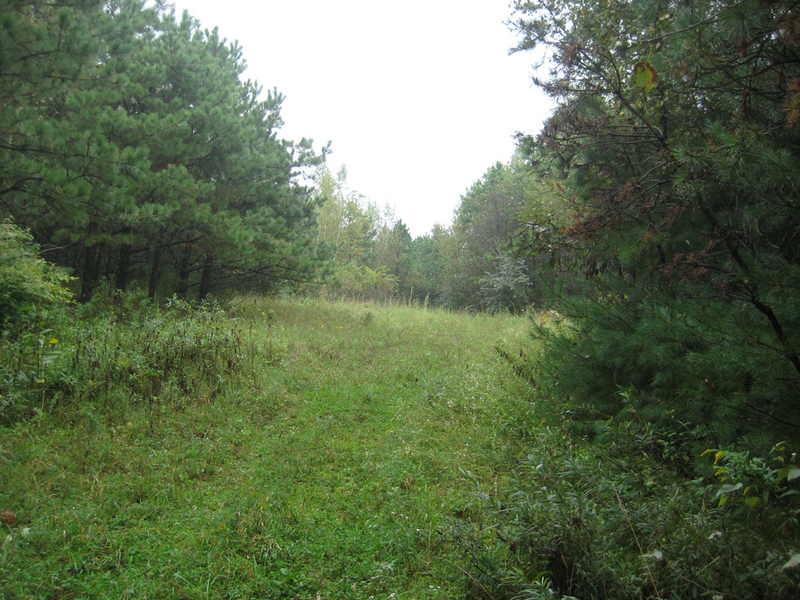 Most of the area is accessible thanks to the conservation land, and remnants of the ski area can still be seen. 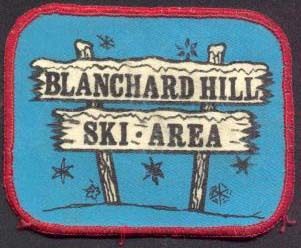 Blanchard was founded by John Kenny in 1959, and first operated during the 1959-1960 ski season. Assisting John was his brother James, who operated or worked at the the Frank Sciuto Mutatation Mink Ranch near the property, according to Glenn Shambroom. 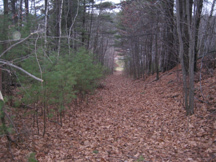 During that first year, the area had just one rope tow and an open slope, described in a January 25, 1960 Lowell Sun article as being "as steep as Belknap [now Gunstock]. 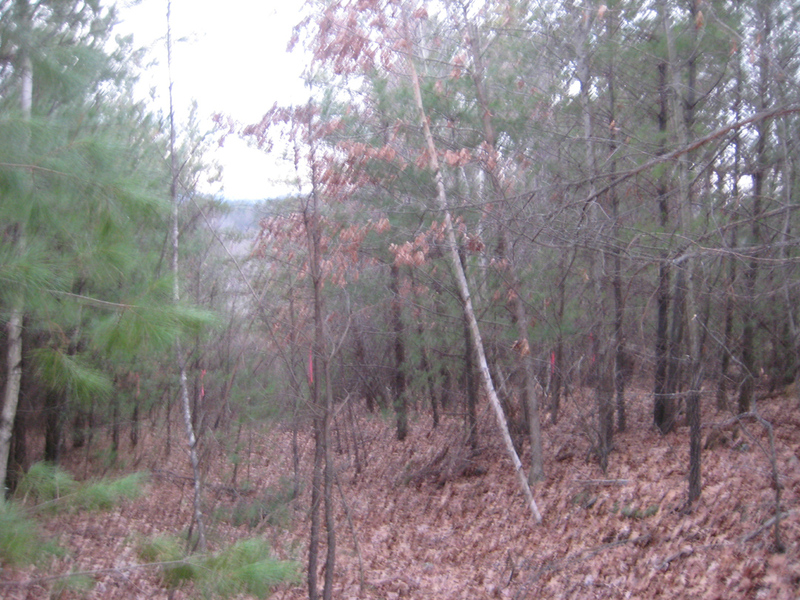 The slope was 1000' long and was rated intermediate. Beginner skiers could exit the low at a lower point to take advantage of less steep terrain. During this season, plans were drawn up to expand the skiing to the northern slope and add another rope tow. 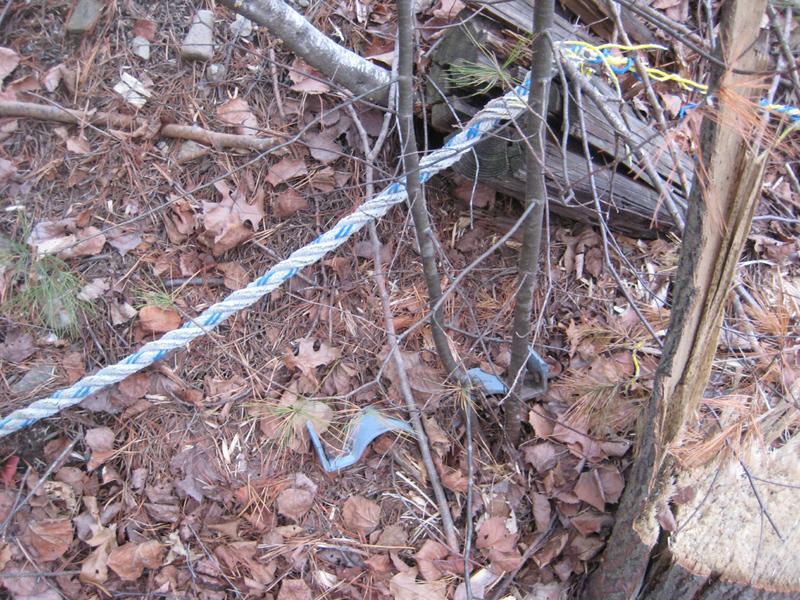 From 1960 to 1966, the area slowly grew, added 2 more rope tows, including one on the more snow prone northern slope. Additional trails and slopes were added, and by the 1965-1966 ski season , an advertisement listed the area as having 3 slopes, 3 action trails, and 3 rope tows. Major improvements came to Blanchard in 1966. A new Hall T-bar, 1340' in length and with a declared vertical of 253' (likely too high, as all measurements show the area having no more than 170') was built to the summit. Featuring a capacity of 1200 skiers per hour, it took skiers up the hill at 450'/minute, giving a 3 minute lift ride. 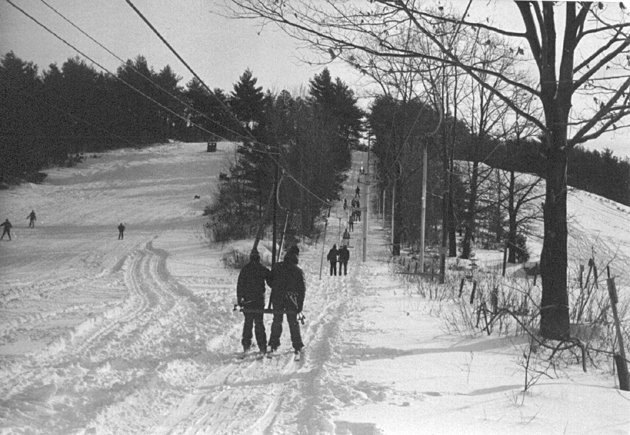 Night skiing became a fixture as well, described by John Kenny as "daylight facilities" in a February 13, 1967 Lowell Sun article. A new base lodge was constructed for the 1966-1967 ski season as well. "We're going to provide a wider variety of skiing than is usually offered. Our T-bar and lifts will get folks to the top of the hill but there we're doing some real development. We've designed trails for the super skier that will challenge - without fear - the week end schusser. We've also constructed trails that will offer the more careful skier the glade type of downhill sport. 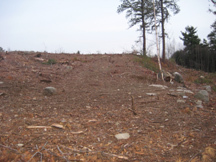 Add the fact that beginners slopes are being graded and we feel that here at Blanchard Hill we will offer diversified skiing." Kenny went on to add that while numerous trees were removed, pines and cedars were left to add to the scenic beauty. Blanchard in 1968. The T-bar is the lift on the right, with additional tows on the left. Two of the tows were parallel with each other to the summit on the north side. The area continued to thrive into the late 1960's, and became quite popular by 1970, the peak year for the number of operational ski areas in New England. At that season, the snow was excellent, the number of skiers was high, and energy costs were affordable. 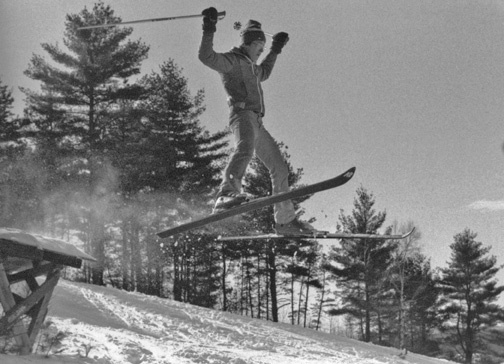 A Lowell YMCA ski course was offered at Blanchard for the 1969-1970 ski season. Left - an advertisement in the Lowell Sun in 1969. In 1971, Kenny began looking at further ways to improve the ski area. 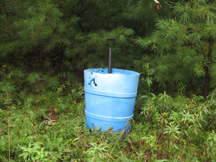 One idea was to use baled refuse from landfills, have them piled up at the top, then cover them in soil, in order to boost the ski area's vertical for an eventual additiona of a chairlift. While sounding a bit far fetched today, this technique had been used successfully at Midwestern Ski Areas. Despite many hearings in town, the plan never came to fruition. By 1973-1974, the gas crisis had developed, and Kenny leased out Blanchard Hill to Don Rand and Ken Upton. Kenny noted that he was hoping that the lack of gas to travel to larger ski areas up north would make skiers stay closer to home. The area survived the crisis, and Kenny went back to operating Blanchard. 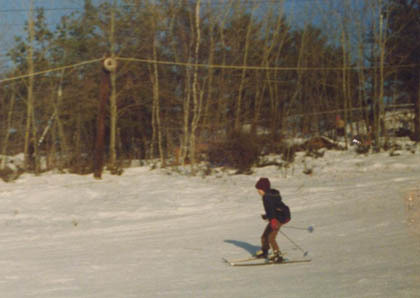 In the mid 1970's, the Lowell Sun had frequent ski clinics at the area. Even hang gliding was added as a warmer month option during the late 1970's. 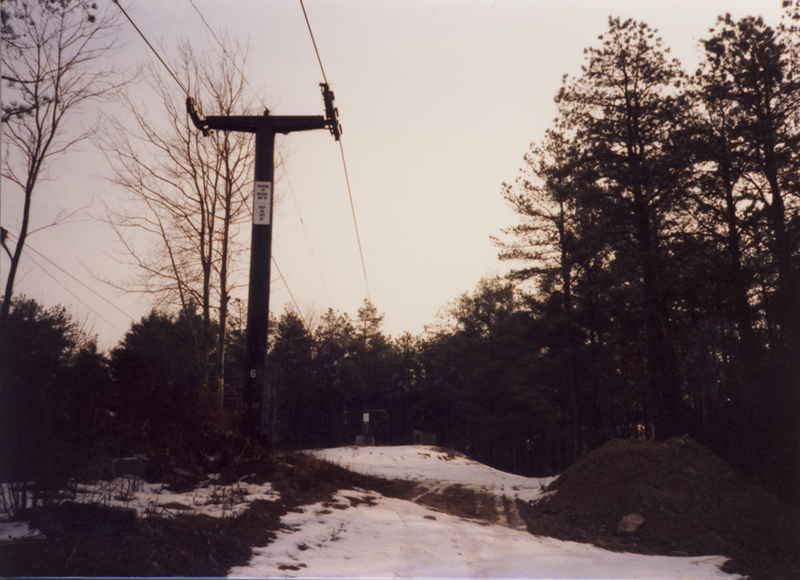 At some point in the mid-late 1970's, a Poma brand T-bar was added on the north side of the hill. The exact installation date is unknown, as is the question if this lift was new, or installed used from another area. Right - the Hall T-bar in 1978, courtesy of Paul Lemieux. 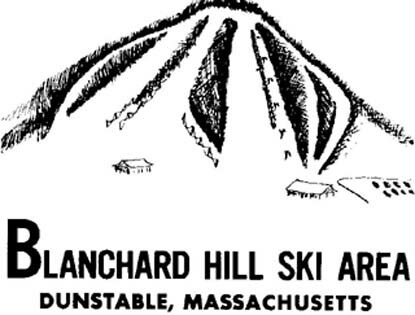 Blanchard was sold in the early 1980's to Art Rockwell, who had been the ski school director. He in turn sold it to William Lamarre at some point in the late 1970's or early 1980's. 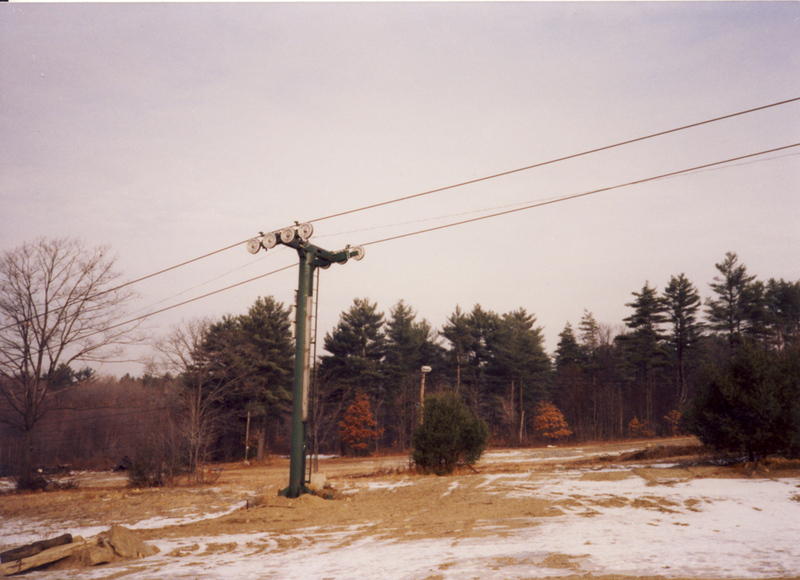 Around 1985, Lamarre purchased the double chairlift from the Bedford, MA Country Club, a rare Pullman-Berry chair. According to Bill Currier, at its new location, the lift was 1176' long with a 166' vertical ascent. A few of the tower sheaves came from a Heron double chair that had been removed from Stratton Mountain, VT. The motor was not large enough, so Currier installed a 30 HP. motor from the old Mueller T-bar that once operated at Tyrol Ski Area. 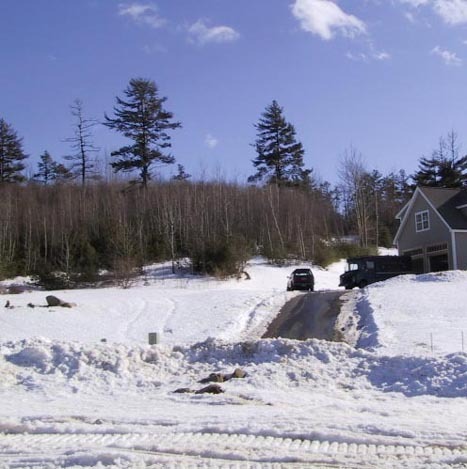 The lift only ran for a few years, when around 1987 or 1988, Lamarre sold the ski area to a real estate developer for house lots. The lift would later be sold to Mount Watatic, where installation was initiated, but never finished as he was never paid for the lift. The chair and one of T-bars from Blanchard were then sold to Nashoba Valley, where it was also never installed. Finally, the chair was given to Temple Mountain, NH by Alan Fletcher as a gift, but it too, was never installed. Currier had recommended that the lift would have been a good replacement for the western T-bar at Temple. Currier did end up with the lift engine that he had acquired as an acquisition from selling the T-bar from Blanchard. Where the lift ended up or if it was scrapped is a big unknown. 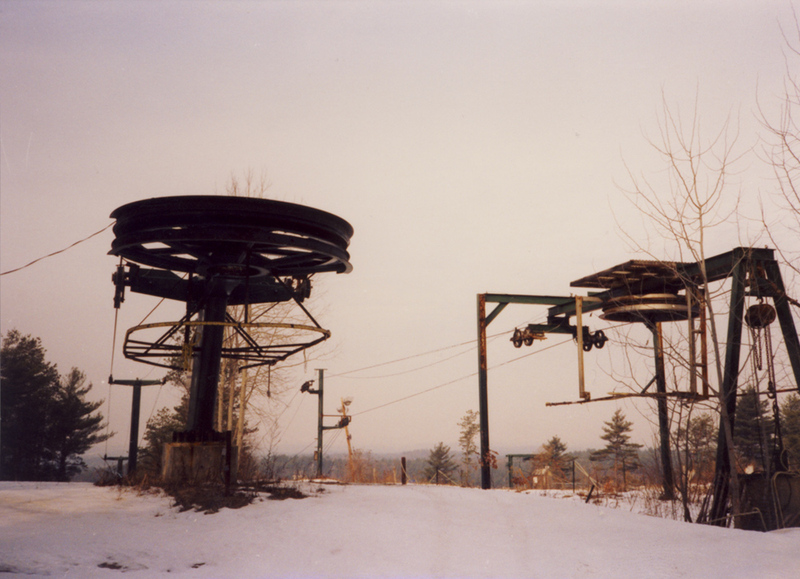 Left-the chairlift circa 1986-1988, courtesy of Bill Currier. Note the base lodge below. 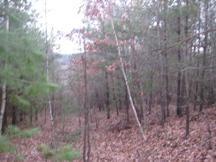 Just to the right, in the trees, is the original Hall T-bar. Click on the image for a larger version. 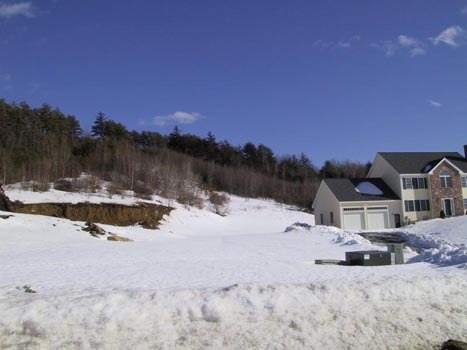 Houses were built across the lower slopes of Blanchard in the late 1990's as part of a development on Sky Top Lane, and the old abandoned base lodge was removed likely in later 2001 or 2002. 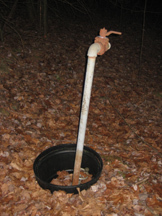 The old snowmaking pond near the lodge was saved and is part of the development. 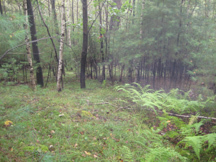 Meanwhile, vegetation grew rapidly across much of the slopes until 2008, with many becoming part of the nearby forest. 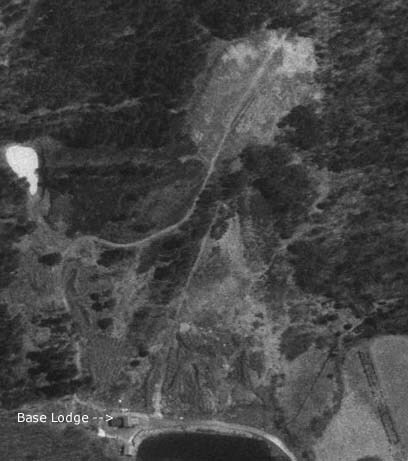 Right - in 1995, the ski area was still quite recognizable from above. 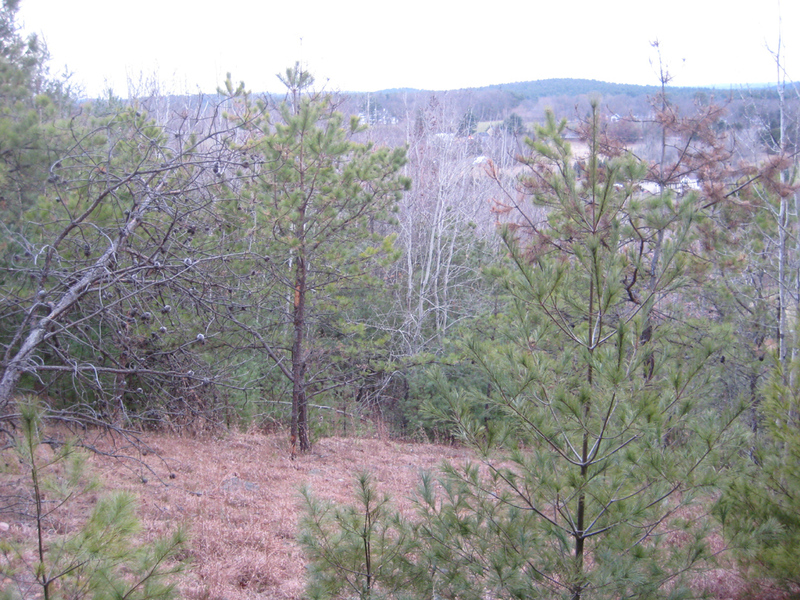 This shows the area just prior to becoming part of a housing development. 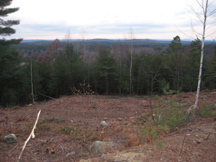 The land that contained the upper 2/3rds of the ski area was purchased by the Dunstable Rural Land Trust, and in late 2008, cleared a portion of the summit to open up the scenic views to the northwest. 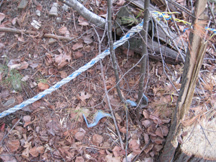 Hiking trails were marked and tied into other existing trails. 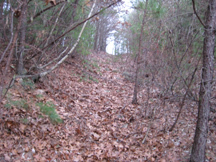 Photos of the area from 2008 are found below. Blanchard, while no longer in operation as a ski area, is still open to the public for passive outdoor recreation such as hiking. It is an easy hike to summit where one can enjoy great views. 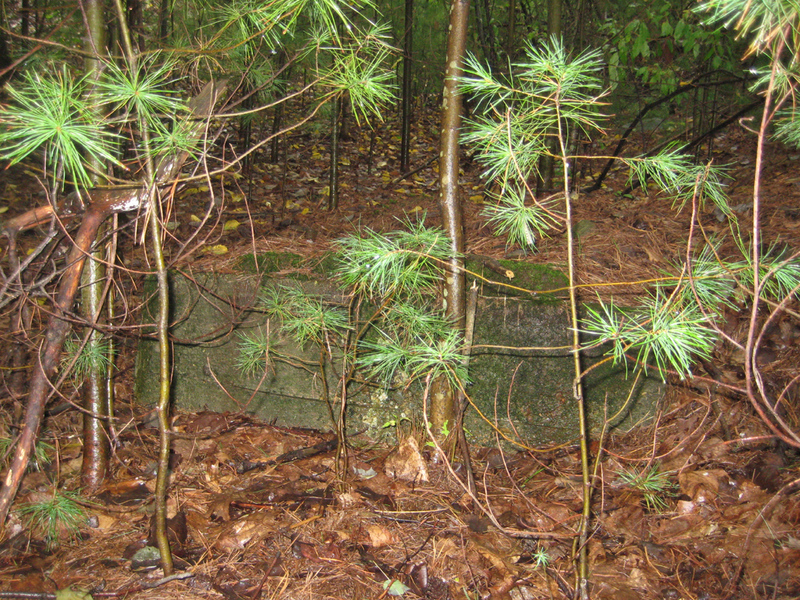 Some remnants of the old ski area remain, including some snowmaking hydrants and foundations for lifts. For more information and a map of the area, please view the following trail map. Note that parking for the area is the cul-de-sac on Sky Top Lane. Paul Lemieux sent us the following historic photos from 1978. 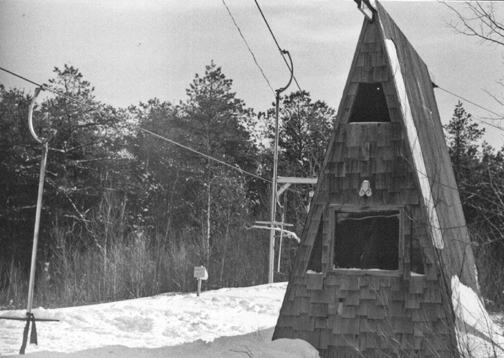 The top of the T-bar, and the A-Frame lift attendant building. Jumper doing a spread eagle. Thanks to Bill Currier, we have these unique photos of Blanchard from about 1986-1987. It is unknown if he had just taken the photos for his records, or if he was taking them as the "before" shots before the chair was sold to Watatic. The photos are in order of ascension to the summit. Click on each for a larger version. Drive for the chair. Tower 2. Note the lights for night skiing in the distance. Tower 3. Tower 4. Approaching the summit. Tower 6. Unload of chair, note unload of T-bar behind. Summit area, showing chair well as two T-bars. 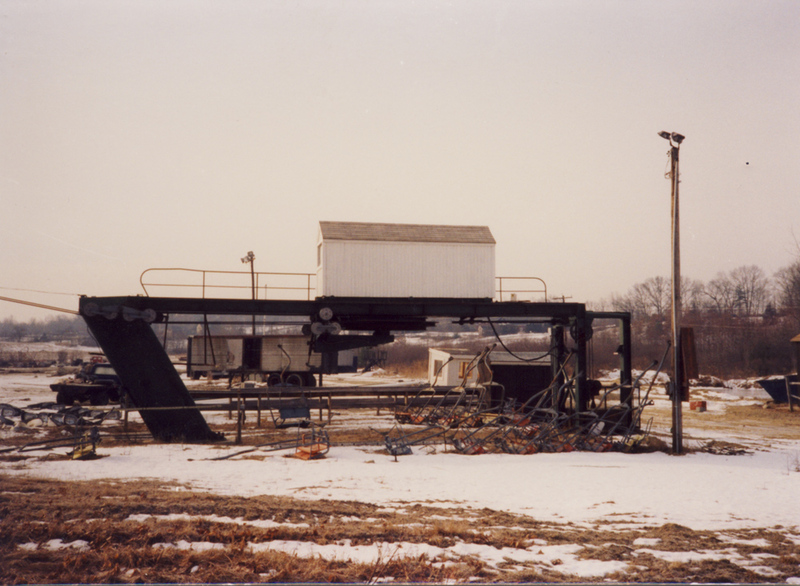 Betsy Brown took the following pictures of the area as it existed in 2001. The base lodge was still standing, though seems out of place with all the expensive homes surrounding it. Looking up at one of the grown in slopes, now in somebody's backyard. 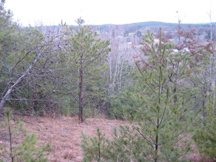 Another view of a grown in slope. The pine trees were definitely there when the ski area operated. The following photos are from two visits in 2008. The first was in September on a gloomy, wet day. The second was on a cold day in December, after the summit area had been cleared. For all photos, click on each to enlarge. 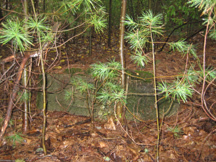 Foundation for the T-bar. 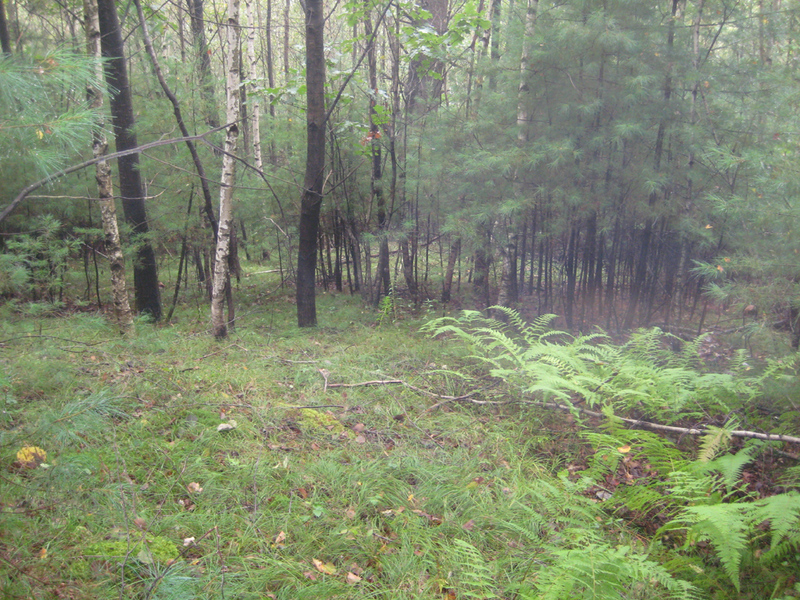 One of the slopes, now forest. 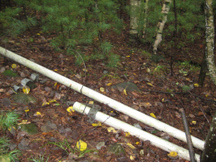 Old snowmaking pipe. Lower T-bar line still clear. Part of the double chair line, grown in. Upper portions of old chairlift line. 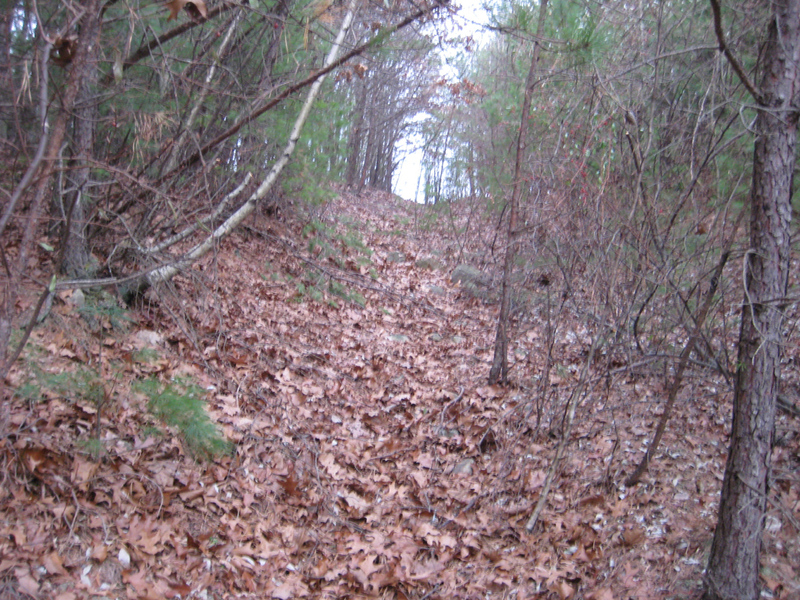 One of the former western trails near the summit. Near the summit, now cleared. Scenic view. Old rope. Snowmaking nozzle. Scott Theurer: I lived right around the Corner from Blanchard Hill in Dunstable from 75 to 83. Skied there many nights, They used to hang glide done the steep front face of it during the summer . I didn't see this in your info but I drove by there in 87 or 88 and the place was closed but there was a double chair replacing one of the t bars. Heather Burns: We lived in Dunstable, Mass. and I learned to ski at Blanchard Hill in Dunstable in the late 60's and have great memories of my dad standing at the bottom of the hill watching us come down. Mike Schramm: I was taught to ski at both Blanchard Hill and Indian Head. The photo I am attaching is from 1974. at Blanchard Hill. I think this is the main slope, the T-Bar is to my left as I recall. I recall many an icy climb up the T-bar. The snow making was not that great, often leaking tons of water onto the T-bar track making for a challenging ride up the lift with my brother Thom. I've always had fond memories of skiing at these hills when I was a kid. The attached image is a lift ticket from the lost Blanchard Hill ski area in Dunstable MA and is from David. raters and bumps in the tracks. Steve Kornacki: And I can tell you for sure that Blanchard Hill in Dunstable was open for the '86-'87 season. That's the year I learned to ski. My parents put me in an after-school program there on Fridays. 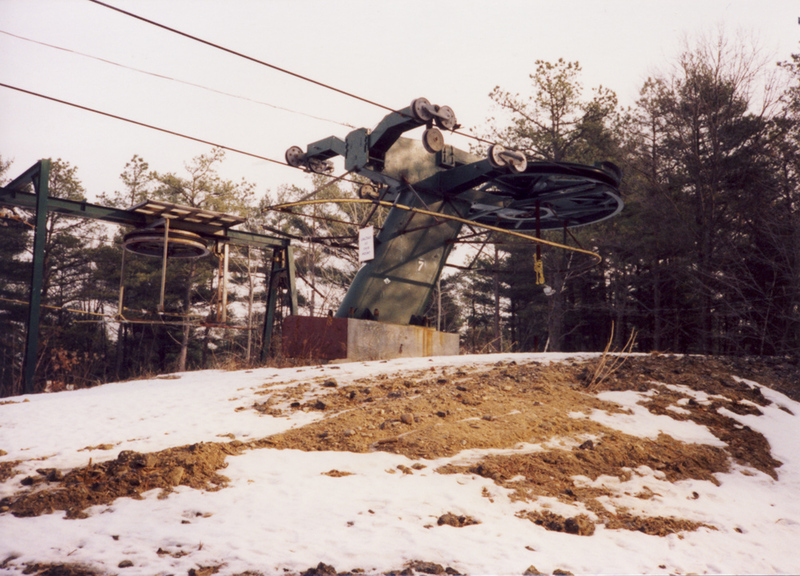 They had a double chairlift (which I guess was new), the old T-bar (which I don't remember being open most of the time), and a rope tow. The rope tow was for the instructional hill, which off to the side, halfway up the "mountain." We had to carry our equipment up there for our lessons, which was pretty tough for a 7-year-old. It's funny: In my mind, Blanchard will always be an imposing, Everest-like peak, even though it was probably half the size of Nashoba Valley. Anyway, it was closed to following winter and I don't remember anything pre-'86. Mike Boivin: I remember in Junior high in Nashua (87-89) a friend had a season pass to Blanchard in Dunstable MA. I remember calling the snow report for lift ticket prices + info once around '87. we were trying to go night skiing but nobody's parents wanted to drive us. And I remember seeing the double chair there. There was also a well known BMX track there and a hanglider launch. I remember trying to go there once but they had closed for the season, so we went and rented the movie "Disorderlies" with the Fat Boys. Jim Boivin - It was open after the '84 season. I was on the Nashua High Ski team and we had a few practices there in the 85-86. The meets and our practices used to be at Crotched Mt. until that went away. Blanchard was close by and very cheap, compared to Nashoba Valley, Temple, and Pat's Peak. A chair lift was located there but I never saw it running. The t-bar was used most of the time, when we weren't hiking up the hill (which actually helped groom it). Art Rockwell - I spent a number of years as Ski School director at Blanchard Hill and eventually purchased the area from John Kenny after a few years I sold to the Lamarre family of Dunstable. Ted Malette - My name is Ted Malette. 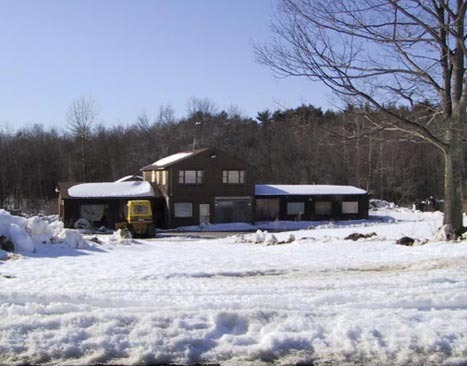 From 1963 thru 1965 I skied Blanchard Hill 3 day a week, after school, as a member of the Nashua NH High School Ski Team. There were no lifts operating on week day afternoons that I remember. We climbed. We were training for slalom and GS. Our coach was Nancy Hendricks. We would leave school at about 2 PM, arrange rides with those of us who had the use of a car and head to Dunstable. We would ski until the light was gone. It worked for us. We were class B state champs for those 3 years. I am not sure how long after my 3 years this training site continued to be used. I have fond memories of our times there and am a better skier for them. Janet Falardeau: Growing up in N Chelmsford, we used to ski there when I was in JR high & high school. The years were 77-80 . And I believe at that time the Lamarre family owned it. It was a great place to go on school nights. And you knew everyone ! I have such fun memories of that place and yes, the T-bar was a treacherous ride at times but it added to the ski areas charm. Michael Power: Blanchard Hills also became a BMX racing area in the 80s. There was a great track at the base of the hill with an electronic starting gate. 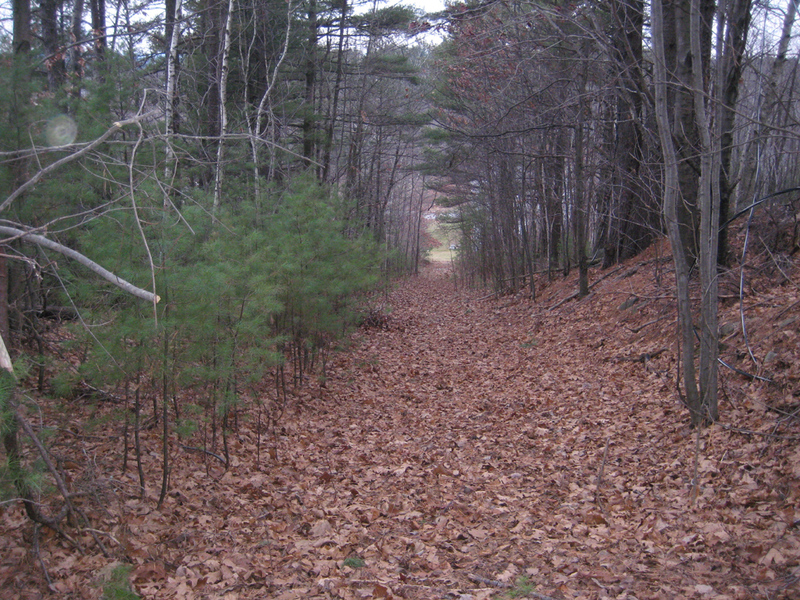 It was one of the best tracks in Massachusetts at the time. I have no idea why it closed down. I used to ride that track a lot! Chris Lemay: I was 16 years old (1986) and a ski instructor for the after school program during the final year of Blanchard Hill. There was night skiing, snow making along with a double chair installed the prior year and there was actually a lift accident that occurred where one chair slid from the cable into the other chair. Had a lot of good memories skiing with friends and working with other instructors my age, we hung out and skied other mountains for years. Every spring Blanchard will close with its annual "slush cup". Michelle Ruby - I learned to ski at Blanchard Hill Ski Area in Dunstable, MA in the mid-80’s; I think I was 5 or 6 at the time, so it must’ve been ’85 or ’86. I rode on that chairlift. 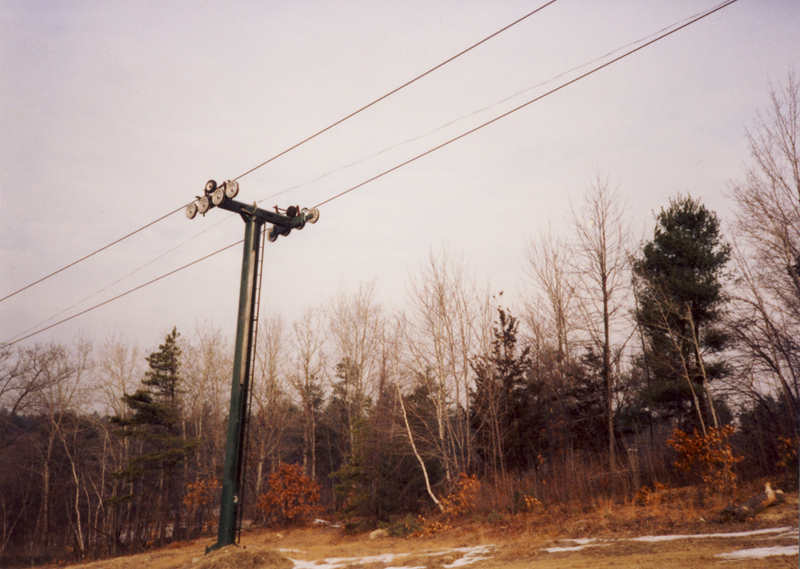 I took lessons after school for a winter, and was terrified of heights, so riding the chairlift was a big deal. My instructor only got me to do it once, and had to be my partner in the chair. My biggest memories of the ski area was that the rope tow on the bunny slope would jerk when it first started, and you had to learn to let it slide through your mitten at first. Inevitably, someone would forget, get jerked, and fall over, so they’d have to stop the tow again. Sometimes it was easier to side-step up the hill. I suppose it’s possible that I took lessons in ’84, before it closed, but I thought I was older. I was pretty young, so my memories are a little fuzzy. 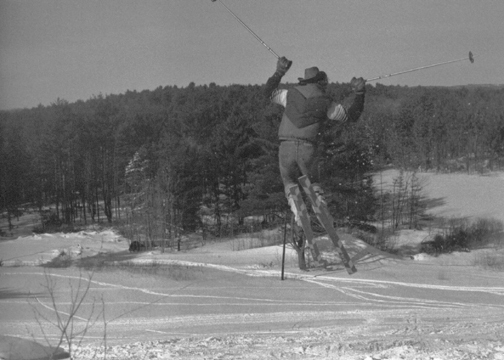 Phil Friel - Hi-I skied Blanchard Hill extensively in the '60's- It actually first opened as a rope tow that ran up the right side of the the front hill in the early 60's. Holding that rope up going up the last steep was almost impossible for a kid. There was a small warming hut built right at the bottom of the hill, to the south of the lodge that came several years later, along with the T-bar. A second rope tow on the leftmost hill was next. We used to side-step the whole hill to pack it for a free lift ticket from Mr. Kenny. Later I spent countless days hang-gliding there, on that same front hill we used to ski. It really was a center of hang-gliding in the area, with an active shop run by a succession of operators, and lessons offered. All in all, Blanchard Hill was a big part of my young life!